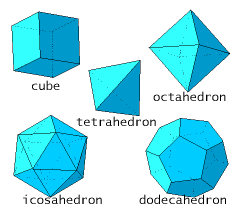 Show that there exist only five platonic solids (that are objects which are build out of the one sort of regular polygons, like the tetrahedron and the cube). Hint: use that for each solid in three dimensions it holds that the number of vertices + the number of faces is equal to the number of edges + 2. Bob buys two things in a shop. With his pocket calculator he calculates in advance what he has to pay: 5.25 dollars. But what he does not notice is that he pressed the division instead of the addition button. At the desk he is not surprised if he hears that he has to pay 5.25 dollars. What is the price of the two things Bob has bought? A number has 6 different digits. If the last digit is moved to the front, then a new number is formed which is exaclty 5 times the old number. With which number did we start?